Sebastian Larsson's first-half goal was enough to give Sunderland their first win at Old Trafford since 1968 and take them to the brink of safety. Barring an unlikely set of results, a single win from their remaining two games will be enough to preserve the Black Cats' top-flight status. And it will be all but confirmed if Norwich lose on Sunday, after Sunderland condemned Manchester United to their seventh home league defeat of the season. Norwich are three points adrift of Gus Poyet's men and must also overturn a 13-goal deficit in matches against Chelsea and Arsenal. Sunderland, for whom this was a third successive victory, conclude their season with home games against West Bromwich Albion and Swansea. But defending champions United have their own concerns. Defeat brought interim United manager Ryan Giggs's winning start to an abrupt end, with Louis van Gaal rumoured to be on the verge of being given the job of rebuilding a club now virtually certain to miss out on European football next season. Giggs made five changes to his starting line-up, which was lacking striker Wayne Rooney because of a combination of illness and injury, and selected two wingers. Yet any hope of the performance being a throwback to thrilling days past soon stalled as Nani and Ashley Young made precious little headway. Nani did fire a long-range effort over and Patrice Evra had a close-range header saved by Vito Mannone, who also kept out a speculative strike from Juan Mata. But, even with John O'Shea's sliced clearance flashing over, it was a paltry return on their dominance of possession, particularly as Sunderland looked as though they could score every time they advanced. Marcos Alonso smashed a volley wide before Larsson's opener, a goal which exposed the defensive failings United have struggled with this season. Darren Fletcher should have prevented Connor Wickham's cross given he had the striker trapped by the corner flag. Then Michael Carrick lost Larsson completely as the Swede speared into the area before sweeping home an impressive finish. United goalkeeper David De Gea then almost gifted Adam Johnson a chance to make it 2-0 with a mis-hit clearance. Within five minutes of the restart, Giggs had introduced Adnan Januzaj for Nani, and midway through the second half Robin van Persie and Danny Welbeck were on too. Manchester United have now lost seven home league games this season -the worst since 1973-74, when United were relegated. Yet it was Sunderland who almost profited from the home side's commitment to attack. Fletcher conceded possession too close to his own penalty area, and when Jozy Altidore crossed, fellow substitute Emanuele Giaccherini struck a post. Welbeck drilled over as United searched for an equaliser, but the penetration required from midfield was lacking, and England boss Roy Hodgson had left by the time Carrick sent a pass intended to send Welbeck scampering free straight out of play. A minute later, Javier Hernandez fired Evra's cross over. Sensing the prize of safety was so close, Sunderland's commitment to remaining solid at the back shone through. Though it was increasingly rare, they still retained a threat - and Fabio Borini became the latest Sunderland man to fire against the woodwork as the clocked ticked down to a famous victory. Match ends, Manchester United 0, Sunderland 1. Second Half ends, Manchester United 0, Sunderland 1. Emanuele Giaccherini (Sunderland) wins a free kick on the left wing. Foul by Danny Welbeck (Manchester United). Attempt blocked. 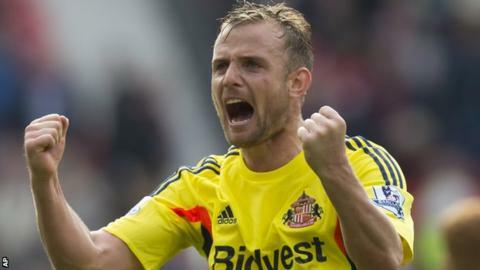 Lee Cattermole (Sunderland) right footed shot from the centre of the box is blocked. Assisted by Jozy Altidore. Patrice Evra (Manchester United) wins a free kick in the defensive half. Nemanja Vidic (Manchester United) is shown the yellow card for a bad foul. Foul by Nemanja Vidic (Manchester United). Jozy Altidore (Sunderland) wins a free kick on the right wing. Attempt blocked. Michael Carrick (Manchester United) left footed shot from outside the box is blocked. Assisted by Phil Jones. Offside, Sunderland. Emanuele Giaccherini tries a through ball, but Emanuele Giaccherini is caught offside. Delay in match Patrice Evra (Manchester United) because of an injury. Offside, Manchester United. Javier Hernández tries a through ball, but Robin van Persie is caught offside. Attempt missed. Marcos Alonso (Sunderland) left footed shot from the left side of the box is high and wide to the left. Fabio Borini (Sunderland) hits the bar with a left footed shot from the right side of the box. Assisted by Emanuele Giaccherini. Attempt missed. Javier Hernández (Manchester United) left footed shot from the centre of the box is too high. Assisted by Patrice Evra. Foul by Darren Fletcher (Manchester United). Attempt missed. Danny Welbeck (Manchester United) right footed shot from outside the box is too high. Assisted by Darren Fletcher. Substitution, Sunderland. Liam Bridcutt replaces Sebastian Larsson because of an injury. Attempt missed. Robin van Persie (Manchester United) left footed shot from very close range is close, but misses to the right. Assisted by Phil Jones with a cross. Danny Welbeck (Manchester United) wins a free kick in the attacking half. Attempt missed. Jack Colback (Sunderland) left footed shot from a difficult angle on the left is close, but misses to the left. Emanuele Giaccherini (Sunderland) hits the left post with a right footed shot from the centre of the box. Assisted by Jozy Altidore with a cross. Attempt missed. Phil Jones (Manchester United) right footed shot from the right side of the box is too high following a set piece situation. Substitution, Manchester United. Danny Welbeck replaces Ashley Young. Substitution, Manchester United. Robin van Persie replaces Juan Mata. Adnan Januzaj (Manchester United) wins a free kick on the left wing. Substitution, Sunderland. Jozy Altidore replaces Connor Wickham. Attempt missed. Phil Jones (Manchester United) right footed shot from the centre of the box misses to the right. Assisted by Javier Hernández.